Blog A Lighter, Zippier Tire for Electric Airplanes? Tires are not usually the first thing that comes to mind when thinking of airplane design. On most aircraft, the landing gear is an awkward necessity, something to help one get airborne and settle on after committing aviation. Our future electric aircraft might have power-driven wheels to shorten takeoff and landing distances, making them less inconvenient and more beneficial. Conventional rubber tires and wheels are heavy, though, and reducing their avoirdupois would enable better performance from a lighter airplane, or allow more batteries for longer range or better performance. Dr. Brien Seeley, founder and President of the CAFE Foundation, wants to visit the best of all possible tire worlds by exploring the potential of polyurethane tires, reducing the need for rubber-based tires along with eliminating the use of fossil fuels. Polyurethane tires have some advantages worth exploring, while we maintain some objectivity about the reasons we don’t see more of them on our cars, for instance. Rubber tires are weighty and require internal bracing (plies) to retain their shape. Look at a bicycle tire which has relatively little heft and a mesh-like internal reinforcement. It’s a bit floppy and not unlike its inner tubes used to hold air. On some tires, especially for cars, rubber and polyurethane both need similar internal structure to enable tires that can grip the road and corner, but the polyurethane tire generally comes out much lighter. For all that, polyurethane tires have not had the “grip” of softer rubber compounds, and earlier versions, at least, lacked the handling capabilities of high-speed performance tires. These matters are being addressed by several manufacturers. 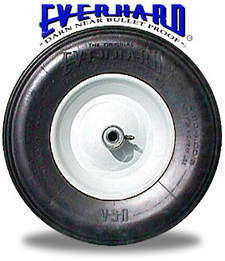 Because of its relative hardness, a polyurethane tire will roll more easily, but offer a stiffer ride. This lack of comfort is not of great consequence on a lift truck rolling on a level warehouse floor, but might ruin a long drive with the family. These qualities are not as essential to aircraft tires, which rarely intentionally go sideways. The idea is to follow the straight line down the runway. For electric aircraft with driven wheels, foam-type polyurethane offers two distinct advantages. They average around 45 percent less rolling resistance than rubber tires, translating to about 10-percent better gas mileage in a car and shorter takeoffs in an airplane. They also last 30 percent longer than rubber tires, mainly because they run 30 percent cooler, suffer less abrasion, and do not harden, crack or deteriorate from exposure to ultraviolet light. Certain compounds of polyurethane stand up well to cold and are used on vehicles such as lift trucks in cold storage warehouses. They don’t “chunk” or fall apart from wear or extreme temperatures. Considering the short-term use of aircraft tires, especially on Sky Taxis, even 50 takeoffs and landings each busy day at 150-200 feet of ground roll for each, with no more than 1,000 feet of ground taxiing at the beginning and end of each trip (Pocket Airparks are small), a Sky Taxi might put 22 miles on its tires. In a full year, the tires would run a little over 8,000 miles. Beyond the low ground operating costs for a Sky Taxi, a life-cycle analysis for the polyurethane tire comes up with some benefits. They require only four percent of the energy required to make an equivalent rubber tire and one-fifth the factory floor space. They are molded to be perfectly round and uniform, according to at least one source. They require one-third the labor and only one-fourth the capital investment cost to make. Their manufacture does not produce harmful emissions. Rubber tires face bans and restrictions on their disposal, and some of the most spectacular and choking fires have been from tire dumps spontaneously combusting. Polyurethane tires are 100-percent recyclable, and have only one-fifteenth the scrap levels of rubber tires in their manufacture. Various makers are experimenting with different formulas and configurations. The tires and wheels could be customized to incorporate wheel motors, an integral part of the Sky Taxi idea and one that will be demonstrated in upcoming Green Flight Challenges. Quiet departures and arrivals, with aircraft accelerating, breaking ground and climbing away quickly and quietly will allow airparks in any neighborhood. Best of all for Sky Taxis, polyurethane tires can be made in a variety of colors, even yellow.